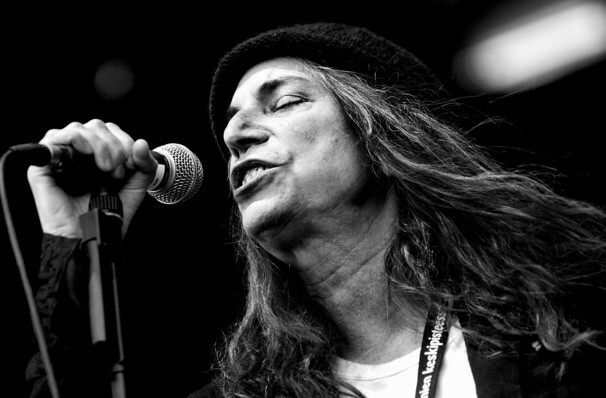 Patti Smith is one of punk's founding figures. She emerged, wiry and tousle-haired, in 1975, with her Tom Verlaine assisted and John Cale produced debut record Horses. A wildly ambitious and forceful album of free form poetry set against a backdrop of new wave guitars, it immediately established Smith as a truly singular artist. Throughout the rest of the 70s, her music shifted towards a more mainstream rock sound, with her 1978 single 'Because the Night', co-written by Bruce Springsteen, marking her commercial peak. In the years since, she's continued producing acclaimed albums (her most recent effort was 2012's Banga), assembled art exhibitions and written her memoirs. Sound good to you? 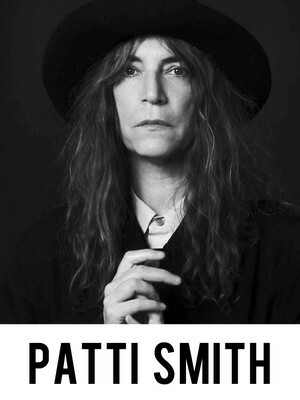 Share this page on social media and let your friends know about Patti Smith at The Fillmore. Please note: The term The Fillmore and/or Patti Smith as well as all associated graphics, logos, and/or other trademarks, tradenames or copyrights are the property of the The Fillmore and/or Patti Smith and are used herein for factual descriptive purposes only. We are in no way associated with or authorized by the The Fillmore and/or Patti Smith and neither that entity nor any of its affiliates have licensed or endorsed us to sell tickets, goods and or services in conjunction with their events.